Esh Group Eagles Newcastle’s answer to Batman and Robin turned up in style to answer the call and powered the Eagles to a superb road win in Cheshire last night. The dynamic duo of Victor Moses and Rahmon Fletcher delivered their special 1-2 punch to knockout the Phoenix’s challenge. 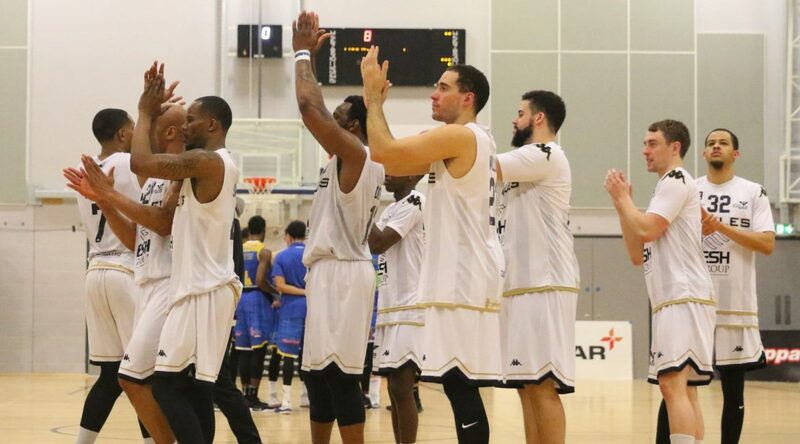 They were not without support though as an energetic Jeremy Smith also weighed in with a fine effort to show the value of Newcastle’s import spots in helping the away side to consolidate their third place in The BBL Championship. That it came after an initial sluggish start in the first quarter when Cheshire threatened to run riot was even more impressive. The Eagles had started Friday night’s win at home against Bristol in aggressive defensive fashion. That was not the case in the first ten minutes last night. After a fairly even opening five minutes, Phoenix looked the livelier in the second part of the first and with Jalen knocking down a couple of triples they poured in 31 points to lead by ten. Fletcher was already in double figures but his side needed more than his efforts to turn things around. Things got worse before they got better. Cheshire continued early in the second to dominate and with the score at 38 – 25 Eagles called a time-out. Whatever was said in that tactical minute break certainly did the trick. A 13 – 3 run resulted with Smith and Moses prominent, cutting the gap back to a single digit. When Moses nailed a triple to end the half, his side had taken the quarter by nine points and it was game-on for the second half as the teams went to the locker rooms at 46 – 45 to Cheshire. The sides exchanged baskets as the game restarted then Fletcher hit a triple to spark a 12 – 2 Eagles burst that saw the momentum swing fully in the visitors’ favour as they opened up a 59 – 51 lead but they were not finished there. Fletcher continued to drive his side forward and the players around him responded in style as they took a 12-point lead in to the final ten-minute period. Kyle Williams had netted the final basket of the third and when he opened the fourth with another, Newcastle had established their biggest lead of the night. Phoenix did hit back momentarily as they scored seven straight to force the Eagles in to another time-out. It was smart coaching from Fab Flournoy and his assistant Dave Forrester as it stemmed the Cheshire tide at the right moment. Coming out of the break Fletcher hit his fifth triple of the game in a six-point run. That mini-run pushed the away side’s lead back in to double figures and gave them sufficient breathing space to see the game out. All Phoenix could do was foul their opponents to try and stop the clock to give themselves hope. Fletcher and Smith though held their nerve and iced the game from the free-throw line as Newcastle completed a season series sweep over Cheshire. It also gave them a fine double-winning weekend and sets them up for next weekend’s double away weekend at Worcester and London City Royals in great heart.